This unique crochet pattern from Alla Koval for summer hand cuffs is sure to make any girl feel like a princess. 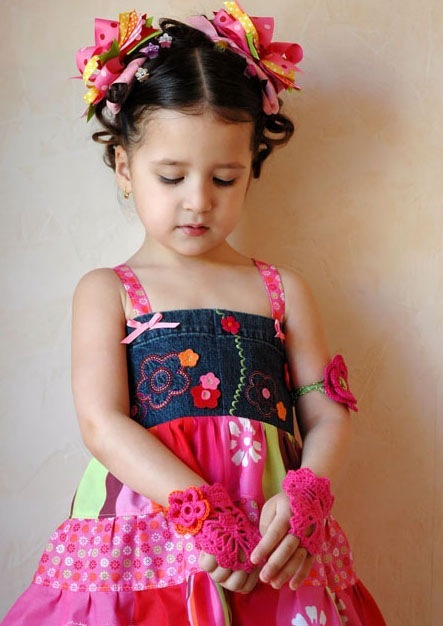 The lovely cuffs, like delicate extended bracelets, feature an open design and crocheted flowers. They are such a fun accessory for summer! Yarn: Sport-weight Patons Grace (MC) 100% cotton (136 yd/1.75 oz/50 g) or Schachenmayr Nomotta Catania (135 yd/1.75 oz) in pink - 1 ball NOTE: to get smaller child size change yarn to thinner. Tension: Be sure to check your tension before starting to crochet - if tension is too tight, change to larger hook; if it is too loose, change to smaller hook. With MC and larger crochet hook ch 48 (54). Row 1(RS): sc in 2nd ch from hook and in each ch across, turn = 47 (53) sc. Rows 2 - 4 (6): ch 1, sc in each st across, turn. Do not fasten off at end of last row. Begin work in Lace patt ( see diagram below). Row 1(RS): ch 1, sl st in next 7 sc, ch 3, dc in next 2 sc, ch 3, dc in next 3 dc, ch 4, sk 4 sc, dc in next sc 2 times, ch 4, sk 4 sc, dc in next 3 sc, ch 3, dc in next 3 sc, leaving rem sc unworked, turn. (3 dc, ch 3, 3 dc) in next ch-3 sp, turn. Row 3: ch 3, (3 dc, ch 3, 3 dc) in 1st ch-3 sp, ch 5, sc in next 5 tr, ch 5, (3 dc, ch 3, 3 dc) in next ch-3 sp, turn. Row 4: ch 3, (3 dc, ch 3, 3 dc) in 1st ch-3 sp, ch 5, sc in next 4 sc, ch 5, (3 dc, ch 3, 3 dc) in next ch-3 sp, turn. Row 5: ch 3, (3 dc, ch 3, 3 dc) in 1st ch-3 sp, ch 5, sc in next 3 sc, ch 5, (3 dc, ch 3, 3 dc) in next ch-3 sp, turn. Row 6: ch 3, (3 dc, ch 3, 3 dc) in 1st ch-3 sp, ch 5, sc in next 2 sc, ch 5, (3 dc, ch 3, 3 dc) in next ch-3 sp, turn. Row 7: ch 3, (3 dc, ch 3, 3 dc) in 1st ch-3 sp, ch 5, sc in next sc, ch 5, (3 dc, ch 3, 3 dc) in next ch-3 sp, turn. Row 8: ch 3, 3 dc in 1st ch-3 sp, 3 dc in next ch-3 sp, turn. Row 9 (finger ring): ch 9 (11), join with sl st in top of turning ch 3. Fasten off. 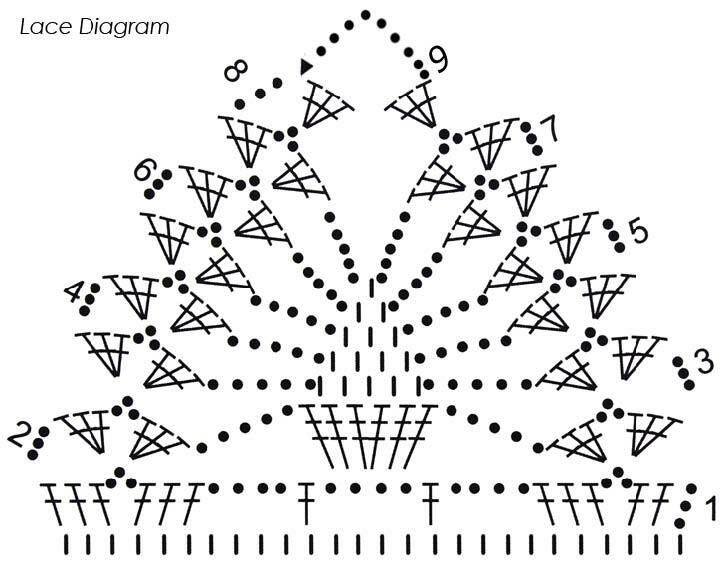 NOTE: Row 9 of Lace diagram shown in child size. Row 1: ch 1, sl st in next 16 (22) sc, ch 3, dc in next 2 sc, ch 3, dc in next 3 dc, ch 4, sk 4 sc, dc in next sc 2 times, ch 4, sk 4 sc, dc in next 3 sc, ch 3, dc in next 3 sc, leaving rem sc unworked, turn. Rep Rows 2-9 of Lace patt. corner; working in free loops of beg ch, sk 2 chs, (3 dc, ch 2, 3 dc) in next ch, sk 2 chs, sc in next ch across to point B, 2 sc in corner, sc in each ch-1 sp to point C. Fasten off. Work the same for Right Hand Cuff. 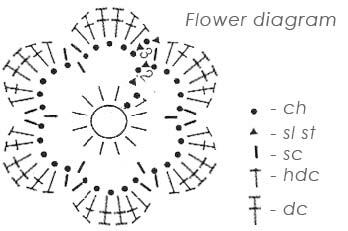 NOTE: See Flower diagram below. With CA and smaller crochet hook ch 6. Join with sl st in 1st ch to form a ring. Rnd 1(RS): ch 2, 11 sc in ring, join with sl st in 2nd ch of beg ch 2. 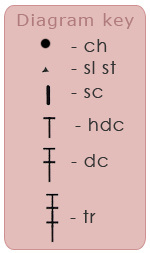 Rnd 2: ch 6, sk next sc, sc in next sc, ch 5, sk next sc 5 times, join with sl st in 1st ch of beg ch 6 = 6 ch-5 sps. Rnd 3 : ch 1, sc, hdc, 4 dc, hdc, sc in each ch-5 sp around (petal made), join with sl st in 1st sc. Fasten off, leaving a 10-15” yarn tail. Make 2• nd flower with MC, but without leaving a yarn tail. With RS of Right Hand cuff facing, thread yarn needle with yarn tail and sew flowers (smaller on the top) in place (see schematic on p. 4, point D for detail). 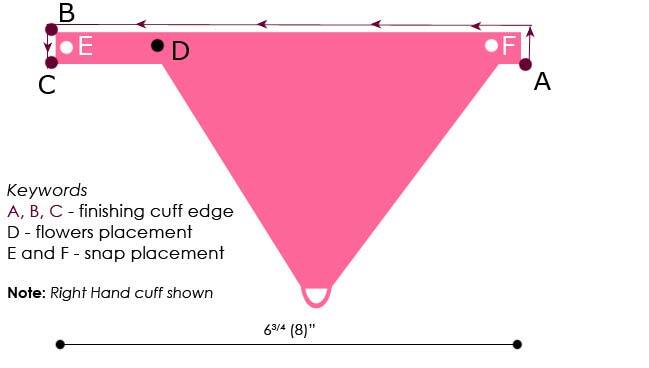 Sew snap on WS of cuffs facing at point E and at point F (RS facing) as desired.